Most investors are risk-averse and any of them would want to construct a portfolio that is optimized for high returns and low risk. Many investment strategies have been devised to attain this goal and the most influential and popular is Modern Portfolio Theory (MPT). Two broad categories of risk were created and help in the theory's goal of creating a portfolio that is optimized between levels of risk and returns. The Modern Portfolio Theory was developed by the economist Harry Markowitz and published in the Journal of Finance in 1952. 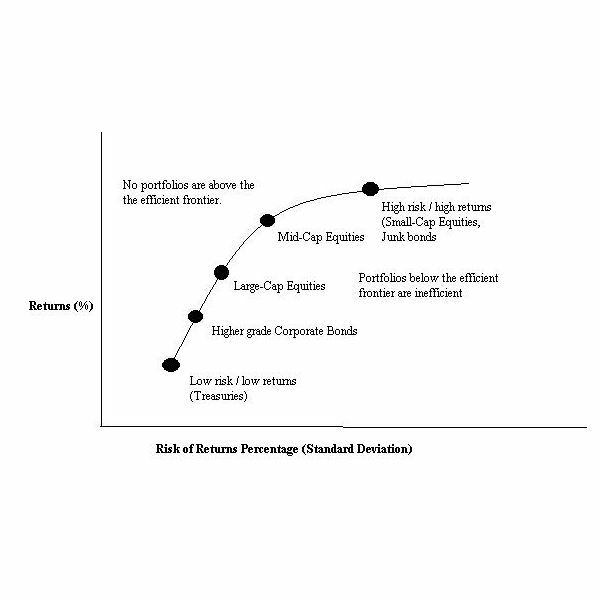 The basic tenet of this theory is that instead of trying to find a single security that possesses an optimized risk/return trade off, that is offering the lowest risk with the highest return, a portfolio could be created that diversifies away the risk for higher returns. This could basically be summarized in the old adage, "Don't keep all your eggs in one basket." Every one knows what risk is and there is actually a certain amount of it involved in everything that we do; it can be remote or very high. This is also true for investing. Any investment has risks connected to it that can affect its performance. Even U.S. treasuries that are considered risk-free are not completely exempt from this. Any government can default on a debt due to various reasons and reasons range from a weakened economy to an extremely debilitating political unrest to global wars. The Modern Portfolio Theory tries to identify what the risks are for investing and how to best deal with them while maximizing returns. Risks are divided into two broad, fundamental categories, systematic risk and unsystematic risk. Country risk – This is usually associated with emerging markets. It's the ability of a nation to pay it's obligations and avoid defaulting on them. This can be contagious for all of the surrounding countries and beyond. This occurred in the summer of 1997 when the Thai Baht depreciated and the Korean Won followed eventually causing a dramatic bailout of investors in the region eventually spreading to nations in Europe and Latin America. Market risk – This is the potential to experience losses during daily market fluctuations, or volatility, of a security or group of securities. Little attention is given to the causes of the fluctuations than to their effect on prices. The volatility of a security is a systematic risk and is expressed as a term known as beta (ß). Beta is usually a current measure as a securities volatility itself can fluctuate over long periods of time. Foreign exchange risk -This arises from fluctuating exchange rates when investing in assets that are valued in a foreign currency. Losses can be experienced when an assets' value rises in price but the value of the currency experiences a decline in relation to the investor's domestic currency. Interest rate risk – Here, a security's value can change with a fluctuation in interest rates. Bond prices drop when Inflation increases providing a discount to investors to make up for the difference between the bond's interest rate and the higher interest rates caused by inflation. Political risk – The risk of changing governments and policy changes can create a higher risk investment environment. This is the reason investors stay away from developing countries. The types of risk in the Modern Portfolio Theory showed creating an investment portfolio involved finding the right mix of securities for consistent returns and that it was possible to find an optimal combination of them to fit an investor’s risk tolerance. The two fundamental categories of risk, systematic risk and unsystematic risk are broad and include a number of important risk factors that should not be ignored when considering an investment for a portfolio.